Fall is a fine time to do investigative work in the orchard and plan for winter or spring pest management. Confirming that our Harrow Delight pear problem was Pear Trellis Rust (Gymnosporangium sabinae) was an excellent warm-up exercise, since the blemishes on the leaves are so clearly identifiable. 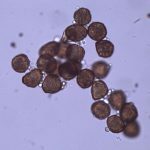 I made a leaf infusion and put a drop under the microscope. 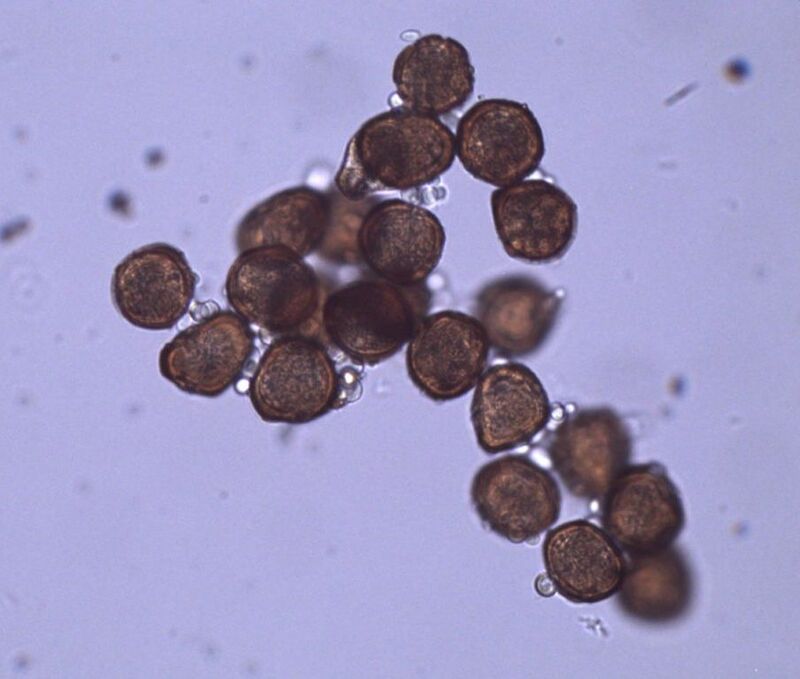 There wasn’t much else to see but for the spores of this particular fungal problem. Confirmed. Another set of eyes is so valuable when reviewing the status of the plants. We warmly welcome Allison, a new volunteer, who joined Sue and I last week as we continued our review of the fruit trees and other fruit-bearing perennials. There was little to study on the Izu; the only problem it had was too many fruit. Of the 24 fruit it presented to us, we only allowed 7 to remain on the tree. It will need time to build a stronger scaffold to support more fruit. We moved on to the Early Fuji for review. The new buds looked cheerful but the Fuji suffered from scab this year. After bloom, we had netted it with bee netting in order to keep the coddling moth at bay. We might have replaced coddling moth damage with scab damage! The apples were still edible and many were pristine enough for the food bank. But, we won’t net next year, in order to assess whether the tree will be healthier with improved air circulation. The scab (Venturia inaequalis) (photo) was also a pretty easy diagnosis but it can be confused with sawfly damage. Again, a leaf infusion confirmed the presence of many of the shoe-shaped spores associated with apple scab. We noticed two male and one female winter moth caught in the Tanglefoot band around the lower part of the tree trunk. Since the moth activity is just past it’s peak, we set about looking for eggs and anything else that might pose a risk to our tree. We didn’t find eggs but Sue was standing at exactly the correct spot to be staring right at the tiny protective covering of a scale insect. Good eye Sue! We were not sure of the scale type so we looked up its characteristics to confirm. I also pulled one apart and set it under the microscope to look at the multitude of white eggs. (A compound microscope can be crudely fashioned into a dissecting one with an extra light source.) 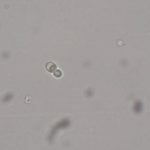 We agreed it was Lecanium Scale (Parthenolecanium corni) and we will pinch those little bumps off the trees as we see them. Next week we review the Mirabelle Plum and its multiple problems, makes notes, develop our plans for that tree in the coming year and, hopefully, find something else interesting to put under the magnifying glass. 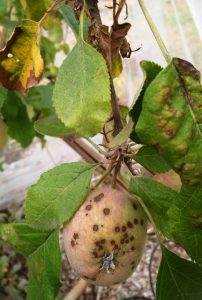 This entry was posted in Plants, Uncategorized and tagged apple scab, pear trellis rust, scale, winter moth on November 30, 2018 by Ruth. Just a comment on scab. 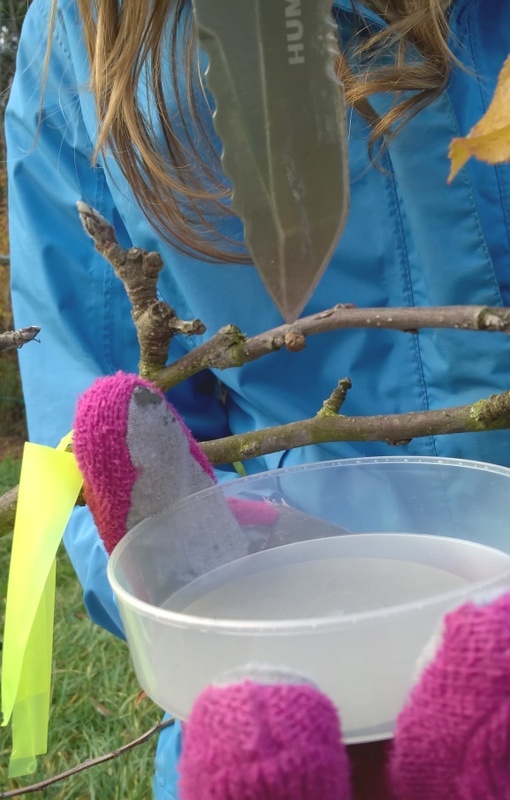 At the Meridian Playground orchard this year, the only trees that showed significant scab – and they had over 80% – are the Red Delicious and Golden Delicious. This is considering all 18 netted trees. There aren’t any Early Fuji trees there for comparison.